Anna ran a single sub-10 minute mile in elementary school, and has been doing improv ever since. Anna hails from Fredericksburg, VA, where she started doing improv as a part of her high school team, Red Box. 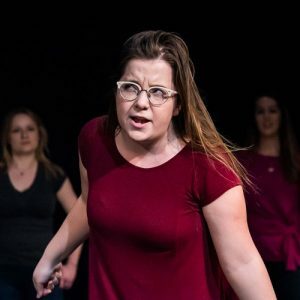 She earned dual degrees in Theatre and Industrial and Systems Engineering at Virginia Tech, all the while performing with her improv team Lolopolis. She completed the iO curriculum as a part of the summer intensive in 2017 and completed WIT curriculum in 2018. As a Taurus sun, Virgo rising, and Capricorn moon, Anna is often heard referring to herself as “queen of the Earth signs.” She is still working a healthy relationship to the Earth though, despite listing “hiking” as one of her hobbies on all questionnaires.